I recently sat down with HP Labs for Part 1 of a five-part series to discuss HP’s future technology vision, and how key global forces known as Megatrends are being used to shape that vision and our future. Here’s a preview of our conversation. Can you explain to us what you mean by Megatrends? Megatrends are global socio-economic, demographic and technological forces that HP believes will have a sustained, transformative impact on the world in the years ahead – on businesses, societies, economies, cultures and our personal lives. The world is in a constant state of change. In the next 15 years there will be more change than in all of human history to date. And while we can never really know the future, understanding the Megatrends that are shaping the world around us can help point the way, and guide us on where the world is going, and the technology that will be needed into the future to help improve our lives. At HP, we’ve identified four major Megatrends that we think are important: Rapid Urbanization, Changing Demographics, Hyper Globalization, and Accelerated Innovation. Let’s start with Rapid Urbanization: by 2030 there will be 8.5 billion people walking the earth. They will be drawn to cities in massive numbers for the promise of a better life. Cities will become larger creating megacities. With bigger cities come major economic growth, particularly in emerging markets. 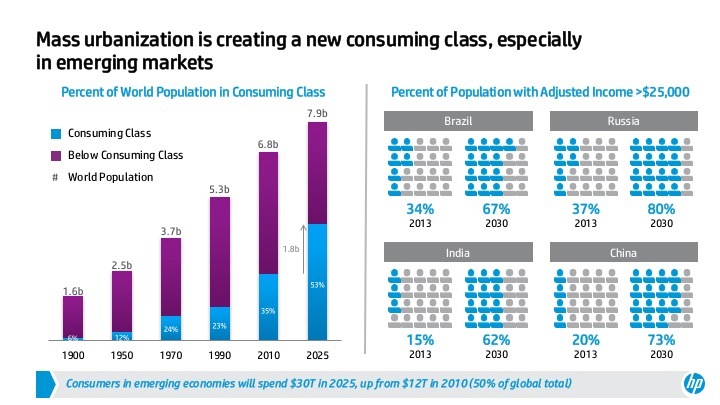 According to McKinsey by 2025, urbanization will welcome an additional 1.8B consumers to the world economy, 95% of them in emerging markets. It will also change how we buy and consume products and services, propelling the sharing economy and convenience-based services. But such rapid urbanization will also take a toll on the environment, requiring us to find ways to reduce the strain on our natural resources and infrastructure. To read the article in it’s entirety and the role I envision HP playing, please visit HP Labs’ blog.